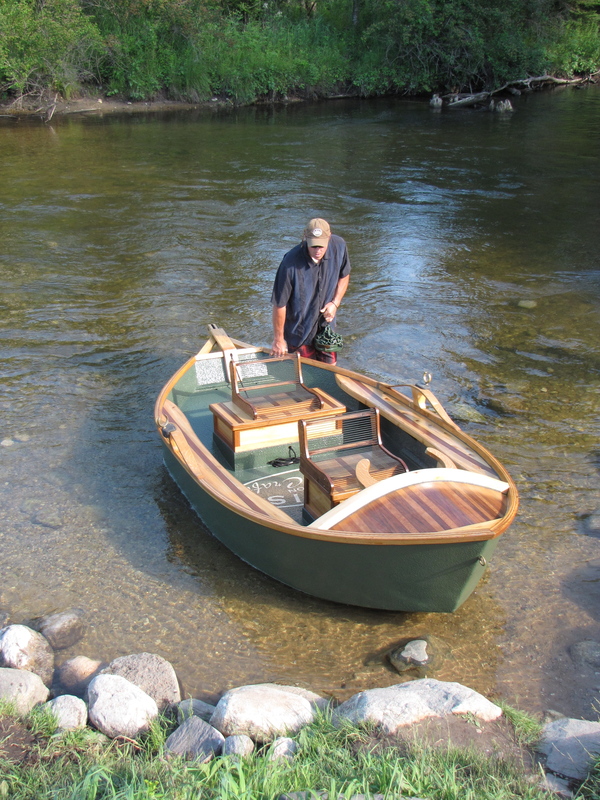 Phil Croff wasn’t planning to start a boat-building business when he constructed his first driftboat in 2006, using Michigan cedar and walnut. He was looking for a safe way to fish rivers at night—a time when big brown trout come out to feed and anglers wade cautiously to avoid stumbling in the dark. Phil Croff gets ready to do some river fishing while floating downstream in one of his custom driftboats. Photo: Courtesy of Phil Croff. based fly-fishing giant, known for its discerning client base. The company’s website features a special 12-foot Orvis Edition Croft Craft that sells for $10,000. 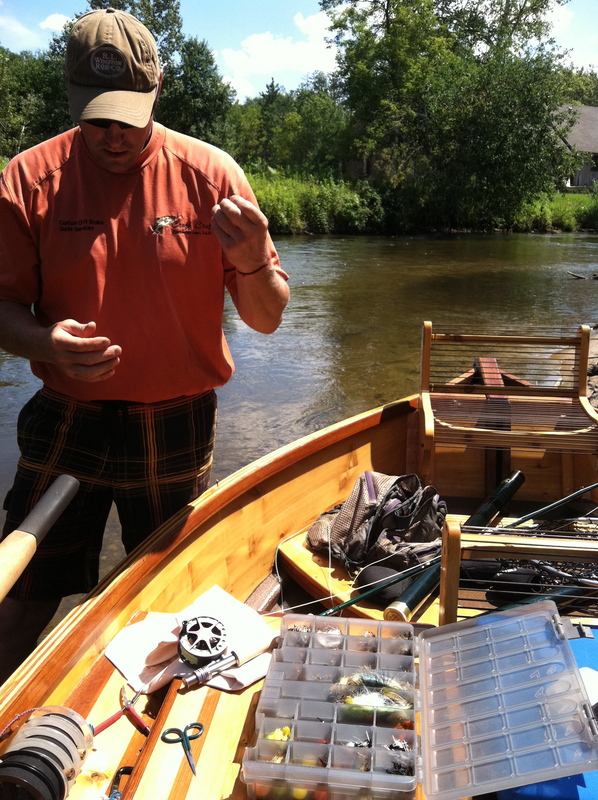 “I had discovered night fishing for big brown trout,” explains Croff, the 43-year-old master wood craftsman from Alanson. “It’s very addicting, but I hated wading at night. So I got online, trying to figure out how to get on the water to do it. The rivers up here are small. There were 12-foot boats out there, but I couldn’t find one stable enough. Trude Bigelow Croff, his wife of 16 years, laughs about the story. She loves floating on rivers with her husband. Wooden boats have “atmosphere,” she notes, more so than fiberglass, the typical construction material. She’s noticed that heads turn when people see a Croff Craft boat go by. wryly. “But Phil is that kind of guy, even in our house. He can’t go out and buy something. He has to make it. 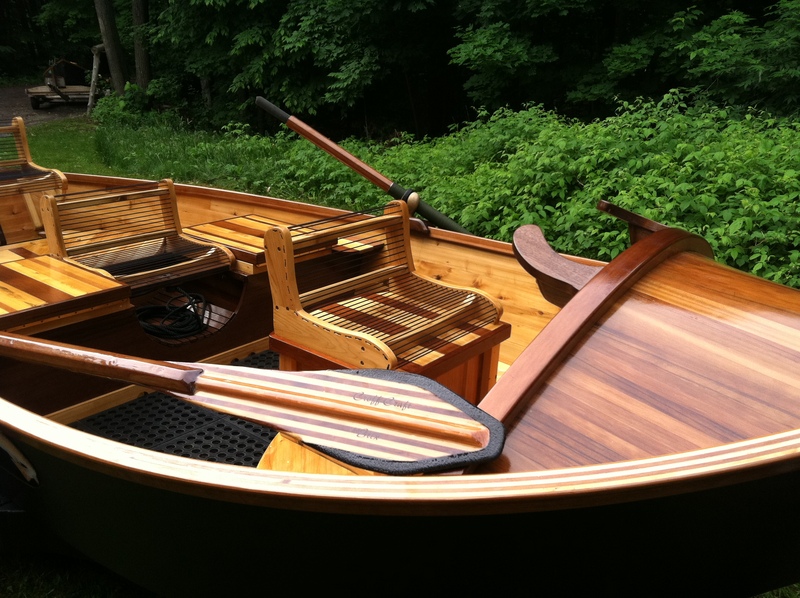 Croff Craft Driftboats are handcrafted, one at a time, to customer specifications. Croff builds them from 12 to 15 feet long. Their deck layouts can be customized, and each offers seating, dry storage, rod storage, an anchor system, and casting braces. Building a driftboat requires 350-plus hours of labor, Croff explains. The hull is coated with epoxy and fiberglass and then sprayed with a Kevlar-enhanced polyurethane product. All of the other woods get two coats of epoxy and seven coats of clear varnish for a brilliant sheen. His custom oars are built from Douglas fir and clear cedar. Each boat is delivered on a trailer for $14,000. Croff grew up fishing northern Michigan’s small, spirited streams, so he knew a wide, stable hull was in order—one that draws just a few inches of water. The Croff Craft driftboat is the product of an inspired moment in 2005 when Croff was sitting in a local pub with a buddy. They were comparing notes about boat design, so he grabbed a napkin and began sketching lines. The result became his signature design. “He’s gotten a lot of attention for it,” adds Trude, an artist and the owner of Beveled Edges, a Harbor Springs custom frame shop. “He built that first one for himself, but people keep asking him to build one. This entry was posted in Uncategorized and tagged Artisans, Boat building, Boats, Croff Craft Custom Driftboats, Driftboats, Fishing, Harbor Springs Michigan, Orvis, Phl Croff, Woodcraft. Bookmark the permalink. Love wooden boats. It’s one of the resons why I go to the Quiet Water Symposium every year. Thanks for the comment. Me too, on both. Phil does a really beautiful job with is driftboats. Great story about starting a business by filling a need.